Location. 37° 2.895′ N, 112° 31.631′ W. Marker is in Kanab, Utah, in Kane County. Marker is on Center Street (U.S. 89), on the left when traveling east. Touch for map. 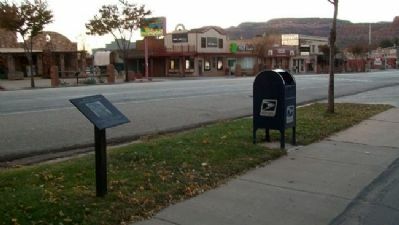 Marker is at or near this postal address: 89 East Center Street, Kanab UT 84741, United States of America. Touch for directions. (a few steps from this marker); John Wayne (within shouting distance of this marker); The Lone Ranger (within shouting distance of this marker). Touch for a list and map of all markers in Kanab. More. 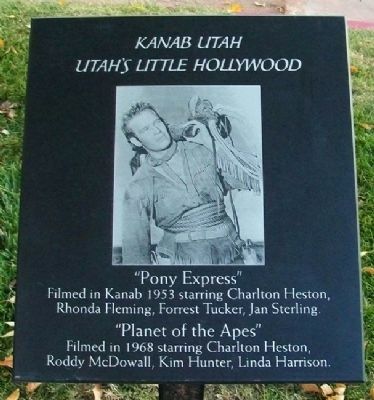 Search the internet for Charlton Heston. Credits. This page was last revised on June 16, 2016. This page originally submitted on March 30, 2011, by William Fischer, Jr. of Scranton, Pennsylvania. This page has been viewed 571 times since then and 10 times this year. Photos: 1, 2. submitted on March 30, 2011, by William Fischer, Jr. of Scranton, Pennsylvania.